Probably everyone reading this blog posting will have heard the story of United Airlines Flight 3411. This was a flight from Chicago to Louisville, Kentucky on April 9th. The video below documents the removal of Dr. David Dao, a physician from Elizabethville, Kentucky, who had booked a seat on the flight. As Dr. Dao and the other passengers were waiting for takeoff, United decided, on a supposedly "random" basis, that Dr. Dao should be forcibly removed from the airplane, since United Airlines wanted to use his seat for someone else. There is no doubt that Dr. Dao had both reserved and paid for his seat, and that he had a very good reason, which he provided to airline employees, for needing to make it back to Kentucky. Early reports were unclear about whether the flight was overbooked, but what was abundantly clear was that United Airlines decided, after Dr. Dao had boarded and sat down, that it wanted to make Dr. Dao's seat available for some airline employees (either United employees or those from another airline - again not perfectly clear) who needed to get to Louisville. 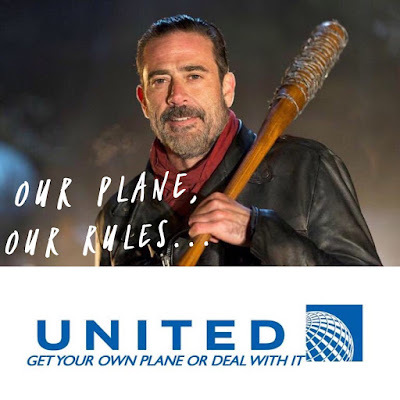 United, apparently, wanted to use four seats on this fully-booked or even "overbooked" flight for airline employees, and managed to get three passengers with reserved seats to leave the plane, by threatening them with forcible removal if they didn't exit on their own two feet. Then, United employees told Dr. Dao he had to go, too. He said, "No." The doctor explained that he had patients to meet with the next day, and needed to make it back to Elizabethville, and that he thus couldn't miss this flight. The incident then proceeded as documented in the video. Commentary has focused on a number of issues. What ARE the rules governing an airline's right to remove passengers who have paid for a reserved seat on a plane? Was this actually a "random" removal of Dr. Dao, or did choosing him reflect a racist willingness to remove asians before white passengers (which is what a lot of people in China seem to think)? Finally, from a business perspective, can United Airlines even survive this incident, given the extreme stupidity of how the airline handled this situation, and the compound stupidity shown by the United Airlines CEO, who promptly went on record with United employees to tell them that their actions were absolutely proper? Looking at the video, which shows black-suited "Security" guards forcibly dragging someone off the plane, bloodying him up in the process, and ignoring his vocal protests, I was most struck by the reaction of the other passengers. First, a number of them vocally protested, themselves. Second, one or more of them took pictures of the incident, and then shared their video with the world, causing the public attention that has made United's behavior into a major news story. This incident looks very much like what one might expect to see in a totalitarian society, in which government agents single out a vulnerable person on an apparently "random" basis, and drag them off, in full view of others, to a fate not known. In other words, as the American public worries about the possible totalitarian tendencies of its current President, this incident offers a real-life "learning" or "training" opportunity. I, personally, felt good about the protests from some of the other passengers, as captured in the video. They didn't all just sit there and watch it go down, which would certainly have been a temptation for those wanting to get where they had paid to go. My question, though, was whether or not those passengers did enough. Suppose Dr. Dao had been dragged off the plane not because of the commercial priorities of United Airlines, but because the government decided that he needed to be disposed of, for some reason that the passengers, of course, would know nothing about? Was the passengers' post hoc protest and publicity sufficient? Better than nothing, I'd say. But more would have been better. To be able to stop these kind of totalitarian tactics by government agents (and the "Security" personnel in this case were government agents, not airline employees), bystanders and observers could, if courageous, have interposed their own bodies between the perpetrators and the exit. What if the passengers between Dr. Dao's seat and the exit had simply stood up, and filled the aisles, so the "Security" people could not get through? What if, after the removal of Dr. Dao, all the passengers had stood up, and told airline personnel that they wouldn't sit down, and let the plane take off, until Dr. Dao was returned to the plane, or until there was a full explanation, with Dr. Dao there to give his side, demonstrating that what had happened was appropriate? Other kinds of actions might also have worked. For instance, after stopping the forced removal of Dr. Dao, passengers might have required the "Security" personnel to explain, to everyone on the plane, exactly what they were doing, and why. These were thoughts I had, watching the video. This was a "real life" incident, in the United States of America, demonstrating how a totalitarian government actually operates. Many of the other passengers didn't like what was happening to Dr. Dao, because they realized (I think) that the same thing might have happened to them. A certain solidarity informed those on the plane who witnessed what happened. You or I might witness something similar in the future. We can learn from this incident. We can think of this as a kind of "training" opportunity, to prepare ourselves to take action to stop, in advance, any effort by the government to employ totalitarian tactics, for any reason, whether political or commercial. In the days of the Civil Rights Movement, this was known as "non-violence training." Maybe it's time to brush up on our skills.